What is the “Purple Equals Parent” program? The “Purple Equals Parent” program is a quick, safe and effective means for all stakeholders in the student transportation process to help protect our most vulnerable young student-passengers: Kindergarten, Grade 1 students. The program is easy to start up and maintain. It is unobtrusive and allows front line staff, bus drivers, to easily identify students requiring adult supervision at their bus stop with just a quick glance at a “purple tag” attached to a school bag or backpack. The purple tag below is simple, user-friendly and generic, and can easily be understood by all involved. The purple tag (also known as “purple band” elsewhere) has been successfully implemented in many school districts in Ontario. As far as we know, Lester B. Pearson School Board is the first school board in Quebec to introduce a similar program. Simply put, the program is a purple luggage-type tag placed at the bottom of the left shoulder strap of an identified student’s school bag. This tag, in conjunction with an awareness program for school staff, parents, and bus drivers, will help minimize the risk of dropping off these students at their bus stops without a parent or their designate present. Communicate the procedures to follow if an adult is not at the designated stop. 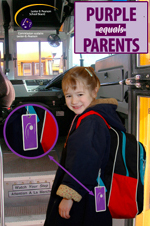 The purple tag is a quick visual tool that tells bus drivers that the student with a tagged backpack needs their special attention as well as adult supervision at the drop-off point. 1. Tagging all students who ride the bus and require supervision at the bus stop. 2. Informing school bus drivers, parents, and school personnel about the program. Remembering the meaning of “Purple Equals Parent”; if in doubt, ask your dispatcher! Handing the child over to a school or daycare staff in a timely manner. Staff at the bus company must work together with the bus drivers, schools, Transportation Services and parents to ensure that these vulnerable students get home safely. Training new and replacement drivers in all aspects regarding this program. Transportation Services plays a coordination role, bringing all the pieces together to form a coherent, consistent system. Offering support to both carriers and schools in resolving recurrent issues of children not being met. The school personnel will be key in ensuring that all those who should be tagged are. They will inspect school bags of students in the PEP program with lists provided for each classroom by Transportation Services each August. Removing tags from Grade 2 students. Enter the name(s) into GPI of the parent(s) or designate(s) who will meet the child at the stop. Parents/legal guardians play a critical role in this program. Contacting the school prior to the students boarding buses if they are unable to provide supervision at the stop.